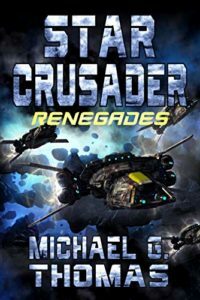 STAR CRUSADER: RENEGADES – OUT NOW! The Alliance Navy’s renowned assault carrier ANS Relentless is sent into action for the first time in more than a year. She’s been significantly enlarged, upgraded and improved with Byotai armour and heavy weaponry. But most significant of all, Relentless is the first carrier to embark a squadron of the alliance’s newest fighters, the deadly F26 Firehawks. Nate and Billy have completed their Academy training and are thrilled to find they’re to be returned to their old home, the Alliance assault carrier Relentless. They are to bolster the ranks of the enlarged Knighthawk Squadron, as two of its most famous pilots. What they find in the Rim will stun every soul in the Alliance and threatens to bring an old enemy back into the fray. With the Alliance on the brink of a new civil war, only Relentless and her band of plucky pilots can make the difference.